Many families today are looking for planning and legacy tools to supplement their traditional estate planning documents. Beyond making sure taxes are paid and distributions transfer smoothly, families care about sharing values and carrying forward a lasting legacy. Although most parents tend to have implicit goals for their children — financial, professional, spiritual, physical, social, and emotional — these big ideas rarely translate into reality by accident. Intentional planning is required and writing a family mission and values statement can be a powerful foundation. 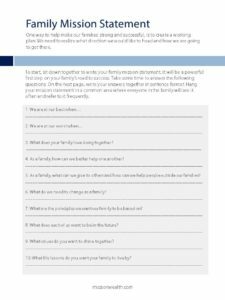 In this personalized declaration, a family is able to outline their values and philanthropic priorities to establish a family’s identity and to reinforce what is important to them. Examples include valuing integrity, work ethic, showing appreciation, or contributing to the community or the world at large. Using video to share communication from grandparents to grandchildren may be a good way to memorialize these important family values. This does not need to be fancy; in this day and age everyone has access to a mobile phone with a camera included. Simply expressing to the camera what you appreciate about each of your family members, as well as sharing some of your greatest life lessons from your own personal successes and failures can be incredibly valued by your loved ones. We wish you the best of luck on making the steps to create your very own lasting legacy!